Home / Review / Best Gaming Laptop under 1500 dollars 2018: The Best that Market has to Offer? 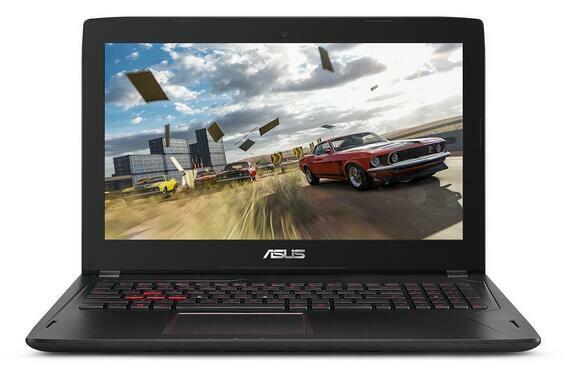 Best Gaming Laptop under 1500 dollars 2018: The Best that Market has to Offer? The hardware debate has heated up, with Intel and AMD both on the rise with core counts, new architectures and new socket designs. While it is going to be tough on the manufacturers and sellers, for the gamers and enthusiasts, things look extremely promising. In the laptop market, Intel’s Kaby Lake and Nvidia’s Pascal architecture has prevailed for over a year, now. Both are power efficient and are expressly designed with the gaming community in mind. 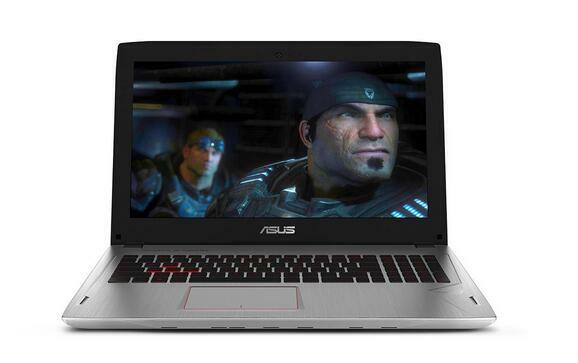 Gamers now have portal laptops that can compete with the desktop grade hardware for both gaming and productivity. Even content creators and power-users find these useful thanks to the immense engineering that has gone into providing crystal clear audio, elegant ergonomic experience and the upper echelon displays with insane refresh rates and real-life color reproduction. However, there are a few things that you might want to be aware of – Law of diminishing returns. Spending twice as much on hardware would not result in twice the performance, in general, but you would see gains less than, say, 50% typically. Another thing to keep in mind is your own use-case and needs. Getting a 1080p resolution laptop with a GTX1070 would be wasteful because the display can’t take advantage of the better GPU to improve visual experience, unless you have an external monitor to connect to your laptop. The same is true for storage, getting an SSD to do the heavy-lifting is a must and then the question arises about how much more space you need on top of that and at this price point it is safer to get an extra Terabyte of HDD for your extensive game library. The same goes with your gaming necessities. Do you prefer high refresh rates? Then you may want a better GPU, and a better display with G-Sync available on your display. Do you want to game for hours and hours? You may want a larger laptop with better cooling rather than a smaller portable version of it. Needless to say, below are the very best of the gaming gear that you can get. Straight from Asus, Gigabyte, MSI and Acer’s gaming lineups all of which are performance centric for the most part of their design. Basic configuration involves having an i7-7700HQ CPU, a GTX 1050 or better and for the most part at least 256 GB of M.2 storage. The same is true for displays you can get the standard 60fps full HD display or you may take it all the way up to a stunning QHD display and/or higher refresh rates. With all that considered, it’s time to dig into the detailed inspection of the most impressive $1000 to $1500 laptops you can order on Amazon right away. The most expensive device on our list, the ROG Strix is priced at $1670 and is the best performer on our list. Despite being above the $1500 price point, it was simply too difficult to not mention this marvelously engineered piece of hardware that even the most professional gamers wish they get a chance to use. The CPU powering this device is an i7-7700HQ which is simply the best CPU for mobile devices in the market. Its performance is desktop grade but it manages to keep the heat generation and power consumption to a minimum. It is clocked at 2.80GHz base frequency and can turbo up to 3.80GHz to handle excessive computational loads. The L3 cache is 6MB in size and is shared all across the 4-core/8-thread architecture. The memory is 16GB of DDR4 which is made from 2 8GB SODIMMs at 2400MHz to provide ample space for all your applications. Just the combination of that powerful CPU and a large RAM will remove a lot of bottleneck in almost all the games. Running multiple VMs and trying to do demanding tasks on Adobe Suite like Video editing/rendering is not going to be a problem at all. Next up, for storage you get a 128GB SSD and a 1TB hard drive. A little disappointing given price point it is reasonable to expect 256GB of state storage at least. Moving on, the GPU is the most impressive hardware in this device. The GTX 1070 with 8GB of RAM is more than capable of handling all the games thrown at it from the most impressive and demanding titles like DOOM or Mass Effect Andromeda or any title that would come out in the foreseeable future. Complimenting this GPU is an equally impressive display which is a 1920 by 1080 resolution panel with a refresh rate of 120Hz and G-Sync enabled. It is probably the hardest thing to explain and the best thing to experience, the displays with G-Sync enabled provide such smooth gaming experience that you would never want to game on any ordinary display ever again. It also has matte finish as a final touch of perfection. The complete body has brushed metal finish and is silvery white in color, other than the bezel and the keyboard which are black. It weighs 4.8lbs and is only 1.2 inches thick. The configuration consists of an i7-7700HQ (4-core/8-threads up to 3.8GHz) with 16GB of DDR4 memory is capable of running most multithreaded applications and virtual machines, not to mention, heavy multitasking as well. The storage solution has the best of both worlds with a 256GB SSD for very short boot and loading times and also a 1TB, 7200RPM HDD if you plan on having an insanely large collection of games and media with you. The Nvidia GTX 1060 with 6GB of VRAM is frankly an overkill for the native 1080p display, but you can connect up to three monitors to this device and one of them can have G-Sync support. The GTX 1060 is more than capable of pushing all the pixels you need. Including running AAA titles even at resolutions higher than 1440p. Only trying to do something extreme like 4K gaming with 120Hz monitor might be too much for the card. The native display is 17.3” panel of standard 1920 by 1080 resolution. You can play most demanding titles on this at the highest settings available no problem. It is an IPS panel so while latency can be an issue for some professional gamers, it does have accurate color reproduction and wide viewing angles helpful for both gaming and content creation. The large form factor also allows greater room for cooling, the vents in the back of the laptop will make sure that the keyboard as well as the internal silicon stays cool even during intense gaming sessions. Speaking of the keyboard, it is an RGB backlit keyboard which can be controlled using Acer’s software. Connectivity-wise Acer isn’t shy either. We get Thunderbolt interface with USB Type-C connector, Dual Band Wifi with MU-MIMO technology, one Display port 1.3, 1 HDMI 2.0, Killer Ethernet E2400 and 4 USB 3.0 ports one of which has power-off charging. The battery life is a mere 3 hours because this device is aimed more for performance than portability. 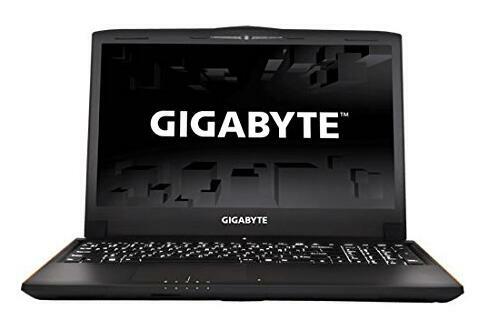 Now coming to a slightly more affordable option, we have the Gigabyte P55Wv7-KL3 which is priced at $1385 which is more than a $100 cheaper than the Acer Predator with the only trade-off being that it has a smaller display (although the resolution is the same). As said before, the major specs are all the same including the powerful i7-7700HQ clocked at 2.8GHz which can go up to 3.8GHz. It is again accompanied with a 16GB of DDR4 memory. Keep in mind it has a single 16GB stick and not 2 8GB sticks, in case you ever want an upgrade. The storage is also similar including 256GB SSD and a 1TB, 7200RPM HDD. Coming to the most important aspect, the GPU is a GTX 1060 with 6GB of GDDR5 VRAM. The GPU can push stunning visuals to the 15.6 inch screen at a native resolution of 1920 by 1080. The display is an IPS panel with matte finish, so there’s little to complain. To better monitor and control performance you get Gigabyte’s exclusive software such as XSplit Game caster and Broadcaster, System Gauge and most importantly Fan Tweak so you can have the perfect balance between low temperature and quite environment. The keyboard is a full-sized backlit one, nothing special but it can get the job done. The connectivity options are also very high end. You get mini-display port, HDMI 2.0 for extended 4K capabilities, USB 3.1 Type-C port and 3 USB 3.0 ports. All of this in a unique black body with subtle orange accents. It is a perfectly sized at 1.33 inches thick and 5.7lbs for the amount of compute horsepower it carries. The price point is also lower than other manufacturers with similar configuration. Performance is always important, especially if the laptop is going to be your main computer for gaming and productivity. However, some of us are looking for a secondary laptop for portable use such as LAN parties or conferences. Something that is powerful enough for an enthusiast’s needs and yet light-weight and easy to carry. This is where Lenovo Yoga comes into picture. 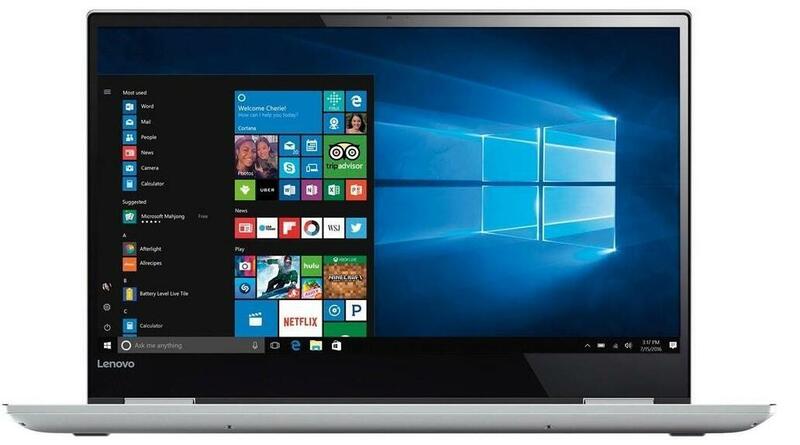 Priced at $1435, Lenovo has invested as much into the usability and portability as it has to high performance. Let’s cover the internal hardware first. The familiar i7-7700HQ makes an appearance with clock speeds up to 3.8GHz, equipped with 16 GB of DDR4 memory it can handle even the heaviest applications easily. The storage is 512GB of all SSD for faster loading of files, programs and shorter boot times. The GPU is a GTX 1050 but before you think that it is underwhelming, you should consider that the rest of it is still and pretty decent card for middle of the road gaming. The gaming performance is still good. At resolutions of 1920 by 1080 or even 1440p it can handle most of the popular titles at the golden 60FPS at medium to high settings. 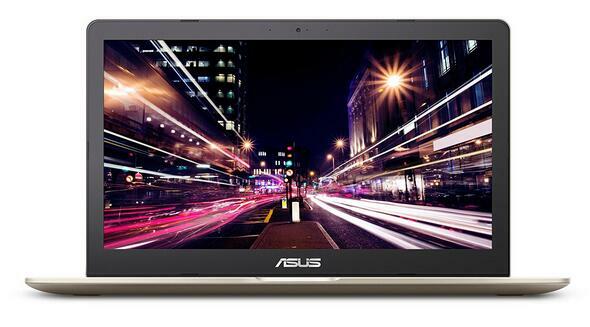 The real selling point however, is the 15.6” 4K UHD display that you get on this laptop. It has full 10 finger touch support and gives you a convenient way to interact with the device when it is in tablet mode. 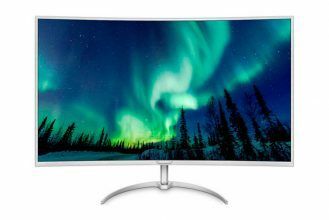 Even when not used for the touch feature, it is a really stunning display especially for content creators and video editors who can make use of the powerful CPU to edit high resolution videos on this display. The form factor is smallish and is only 0.8 inches thick weighing only 4.8lbs. Connectivity options include, 1 Type-C port, USB 3.1 port, 2 USB 3.0 ports and of course Bluetooth 4.1 and Dual band WiFi with 802.11 ac. As opposed to most gaming laptops with very little battery life, the Yoga 720 has up to 8 hours of battery backup for continuous casual use and media streaming. This is truly a good balance between power and portability. 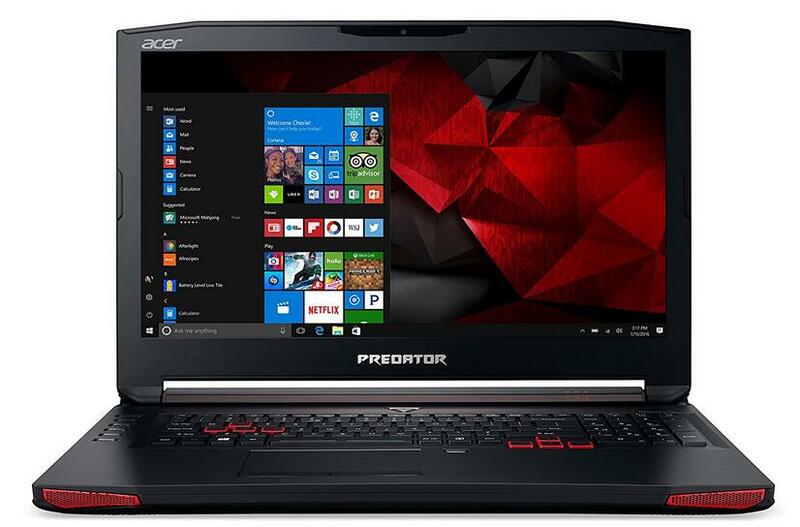 We are seeing the second Acer Predator on our list. 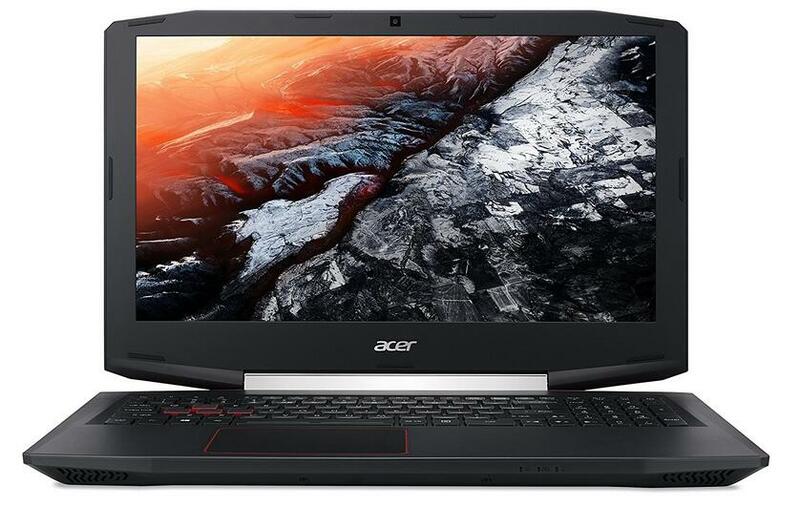 Acer has painted themselves in a corner by creating a more affordable option than the previous Predator that we have seen. The only downside is a standard 15.6” screen rather than a 17.3” one. Most gamers would actually prefer this smaller form factor. It is quite well-priced at $1050 only. The internal hardware consists of an i7-7700HQ processor with 4-cores/8-threads with up to 3.8GHz of clock speed and along with it is a single DIMM of 16GB of DDR4 memory. The storage solution includes only a 256GB SSD and we see no extra HDD but that is understandable given the price point. The GPU is yet again a mighty GTX 1060 with 6GB of VRAM. This is enough to power even the high end displays playing the most demanding title so the 15.6” IPS panel with 1920 by 1080 resolution can be handled pretty easily. The panel also has matte finish which is always a welcomed feature. 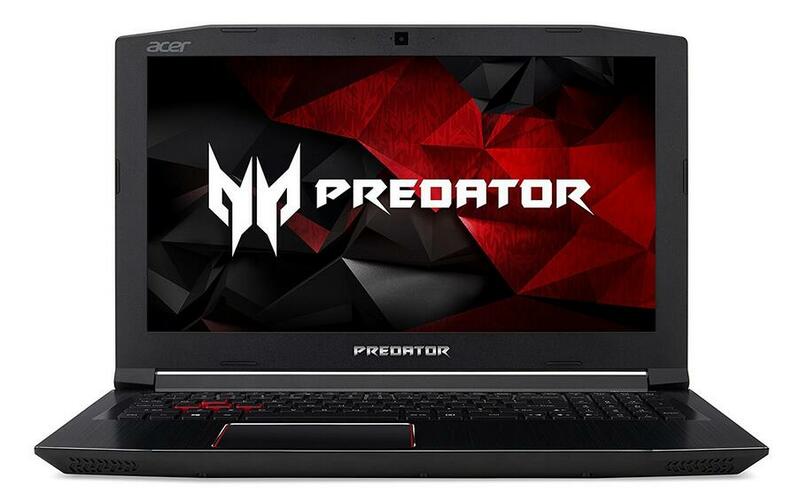 The look and build quality is similar to the previous Predator laptop in our list. Black metal chassis with red accents and the same theme is carried over to the keyboards with red accents on the arrows keys and W, A, S and D keys letting everyone know that this laptop and its owner taking gaming seriously. The keyboard also has a red backlight. In terms of battery life, it does a decent job of up to 7 hours of average back up under light or casual use. It weighs 6 pounds and stands average in terms of portability and the dual cooling fan provides enough comfort that you can work on it for hours and not feel it get uncomfortably hot. It is a good bang for your buck, despite lacking large storage or displays. Connectivity options are also bleeding edge, including USB 3.1 Type-C (Thunderbolt 3), Dual band WiFi thanks to 802.11ac, RJ-45 port for LAN connectivity, 2 USB 2.0 ports, 1 USB 3.0 port and an HDMI 2.0 output port. The ROG Strix GL502VM is about $300 cheaper than the previous Strix in our list and that was some serious hardware. Even after dialing it down a little, this particular model still packs quite a punch and is priced at $1300. The processor is our now familiar i7-7700HQ which can have clock speeds as high as 3.8GHz. The RAM is also the standard 16GB DDR4 and all of this just ensures that your productivity and gaming is never hampered because of the CPU or memory bottlenecks. Next up is the storage and we see 2 separate storage devices – A 128GB SSD and a 1TB HDD and again, Asus has that disappointingly small SSD when all their competitors provide at least 256GB out of the box. Gaming performance is still uncompromised. The GTX 1060 is more than enough to handle demanding games at 1080p and 1440p resolution with frame rates well above 60. The display on the laptop is a 15.6” IPS panel at 1920 by 1080 resolution with G-Sync supported, this makes sure that you make the most out of your graphics card, every last drop of performance can be utilized for either better visuals or higher frame rates without abrupt screen tearing. The ergonomics and aesthetics are well thought-out with silvery-grey finish on a metallic case and black bezel and keyboard. Dual fan cooling ensures that your keyboard doesn’t turn into lava although the CPU internal temps were a problem in the beginning but reports have it that driver fixes have resolved that issue. Options for connectivity include 802.11 ac Wi-Fi, RJ-45 port for Ethernet, 1 USB 3.1 Type-C connector. Also available are HDMI 2.0 out and a mini-display port. The laptop weighs 4.9lbs. 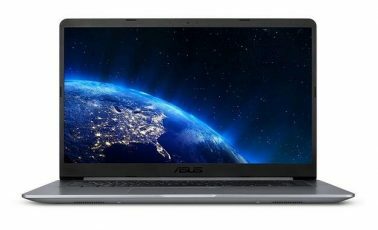 Next up we have a middle of the road configuration from Asus aimed at providing performance, storage and a responsive system at only $1150. The major corners cut are the VRAM where you get only 3GB of video memory instead of the typical 6GB that v 1080p display, this is not that big of a drawback although, we will see about it in detail. The i7-7700HQ processor makes yet another appearance clocked at 2.8GHz with turbo up to 3.8GHz. Along with it is 16GB of DDR4 memory and for storage there is the same combination from Asus including 128GB of SSD and 1TB of HDD storage (5200RPM). Gaming is where most enthusiasts would be concerned the most but the GTX 1060 with 3GB of VRAM can handle almost any games you throw at it just as well as the 6GB variant would do for the native 1080p display. Of course, you may run into issues while rendering 4K textures or with anti-aliasing turning up to eleven would consume the entire VRAM easily. Since the GPU is still a 1060 the critical performance metrics like frames per second and all would not be hampered if you don’t end up consuming all the VRAM. With continual driver updates, the memory utilization of games also improve so keep that in mind. Ergonomics wise the design is at best mediocre, but that differs person to person. The complete metal chassis has a brushed metal finish to it and the Chiclet keyboard is backlit with tactile feedback to it. Cooling is achieved through dual fan configuration and the entire laptop weighs 4.9lbs making it reasonably portable. Connectivity options 3 USB 3.0, 1 mini-Display port, an HDMI port, 1 RJ-45 port for Ethernet connectivity. The Wi-Fi uses 802.11ac standard so you get all the dual band goodness too. The Acer Aspire VX15 is a budget oriented laptop and with optimum design and hardware decisions and not over-powering the one hardware component just to making it more appealing to the naïve buyers. 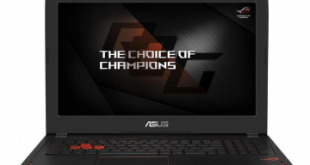 It is priced at only $1000 and still guarantees that you are going to have fun gaming on it, instead of worrying about the latest and the greatest performers or long winded benchmark results. The CPU is an i7-7700HQ which, as we have seen before, is quite power for both gaming and video editing. For main memory we have 16GB of RAM and the so every demanding application like Adobe Suite will perform smoothly enough for you to edit and render on-the-go. The next important thing is, of course, the GPU, which in this case is an Nvidia GTX 1050Ti with 4GB of VRAM. 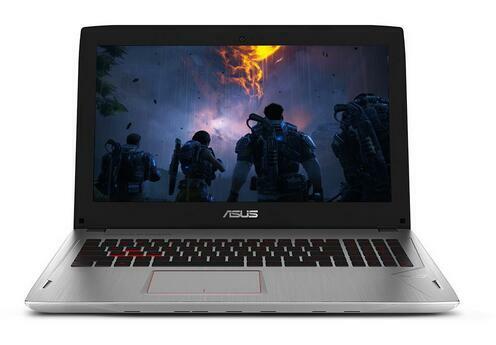 It is significantly weaker when compared to the GTX 1060 we have seen thus far but, realistically, it can play even the most demanding titles at the laptop’s native resolution of 1080p at medium to high settings. This cost cutting from the GPU is what allowed the manufacturer to invest into a 256GB SSD which provides ample room for your files and applications. There is also the option of adding extra SATA drive if you wish for it. The build quality is yet again sturdy and the body has red-on-black accents; something that every gaming laptop has for some reason. The display is a 15.6” IPS panel of 1920×1080 resolution which means wide viewing angles and accurate color reproduction. The next thing to look at is the connectivity options which include 2 USB 3.0 ports, 1 USB 2.0 port, 1 USB 3.1 Type-C connector, an HDMI port and lastly an RJ-45 for Ethernet connection. The laptop weighs 5.51lbs and has a reported battery lifetime of 6 hours, obviously not while gaming. Closer the Acer model above, this laptop from Asus is priced similarly at $1050 and offers performance similar but not exactly the same as the VX5-591G-75RM with some tradeoffs that would segment the market between power users and the ones who need portability. Not at all a surprise at this point, the CPU is an i7-7700HQ at the advertised speeds of 2.8GHz and up to 3.8GHz if the need arises. The RAM is also the standard 16GB DDR4 technology that we have seen all through our list, so nothing to complain there. The storage is one aspect where the Asus model is better. It has the sweet spot of 256 GB SSD and 1TB HDD that everyone with a large collection of games would eventually need. This is, however, overshadowed by the lack of a powerful GPU, the GTX 1050 with 4GB of VRAM is powerful enough to run most games but only at the native resolutions of 1080p and then only at medium to high settings. For most demanding titles like the new DOOM you would have to dial it down even lower to have a good experience. Ergonomics and build quality sharply resembles the Apple MacBook’s golden metallic chassis with notches for lifting the lid. It is also quite thin although not nearly close to a MacBook and weighs 5.1 pounds. Heating is going to be an issue despite the dual fan cooling simply because the space inside is too crammed for running the hardware under load for prolonged periods. The display is a 1920 by 1080 resolution TN panel and this means poor color reproduction and smaller viewing angles, but lower latencies while gaming too, and some gamers actually prefer that over IPS. Peripheral connectivity is offered via Dual Band 802.11 ac Wireless, Bluetooth 4.2, 1 USB 3.1 Type – C (Gen 1), 1 USB 3.0 port and 2 USB 2.0 ports. Also available is an HDMI 4.2 out. When spending near to $1500, you enter the enthusiast regime and the primary objective shifts from portability to well performing, future-proof hardware. Most of the laptops had a GTX 1060 which is more than capable of supporting Ultra-Wide display with resolutions larger than 2K. To make the most out of them you’d need USB Type-C support or mini-Display port adapter, and a good enough display. With that and the 7700HQ it is finally becoming reasonable to replace desktops with high end, well designed laptops. Especially if you do have spare monitors lying around or if your Intel Haswell build has finally given up on you, this might well worth be the upgrade.